Captain William Patrick ‘Pat’ Hone MC (1886 – 1977), was a descendant of artist Nathaniel Hone and of stained glass artist Evie Hone. He was a brother of Joseph Maunsell Hone, the publisher. Hone was born in Dublin, and educated at Wellington and Trinity College Dublin’s School of Engineering, from which he graduated in 1910. After leaving College Hone worked in Dublin (on the Cross Guns Bridge) and in Canada from 1911 on the Canadian Pacific Railway; he subsequently joined the 2nd Canadian Division Engineers, which fought on the Western Front. He became firstly a Lieutenant and then Captain in 1918, the same year in which he was awarded the Military Cross. His first wife Mary, who died in 1941, was a member of the Collis family. She also went to France during the war working in a canteen as part of the War effort. After the War Hone went to work in India where his daughter, the author Leland Bardwell, was born. He worked on the Madras Southern and Western Railway. The family returned to Ireland and set up home in Leixlip House and Pat Hone founded a furniture manufacturing business. 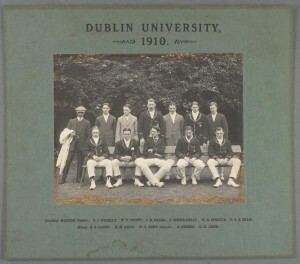 Hone played cricket for Ireland six times between 1909 and 1928. He also published a book in 1956 entitled The history of cricket in Ireland. The Hone letters were acquired as part of the Leland Bardwell literary archives in 2007.